Flipping channels recently one night I landed on the 2012 film Gangster Squad. A vague memory of the pre-release studio trailer played in my head, followed by the thought that I might watch this epic. But then I was jolted back to the present by the shocking visual of a prosthetic-enhanced Sean Penn mumbling through a Mickey Cohen impression both too ridiculous to watch and too hard to turn away from. Why, Hollywood, why? Every 10 years or so, the studios feed us a glossy if noirish postcard from Los Angeles past. Like all postcards, they’re beautiful on the front, blank on the back. The pitch: nearly real characters, acting out a nearly true history where a beautiful city always competes to win best supporting actor. There are mobsters and gangsters and crooked cops, driving old cars and being played by beautiful young stars. But we never learn, much less remember, the real people who stood up to L.A.’s gangsters. Who were they? If you look hard enough around the city, their names are preserved. Fletcher Bowron Square downtown, the John Anson Ford Amphitheatre, John Dockweiler State Beach, and perhaps the most quietly famous, Clifford Clinton of downtown’s Clifton’s Cafeteria. Silent monuments to great men that we know only by the places named for them. Clinton was perhaps the greatest of all, a man who protected us from the protectors. A decade before the likes of Mickey Cohen and Bugsy Siegel came to town, Clinton fought overwhelming forces of corruption in an era when mayors were crooks and L.A. cops were bagmen and bombers. He was a World War I veteran and missionary in China who moved to Los Angeles and continued his family’s history in the restaurant business by starting Clifton’s Cafeteria in 1931. Clifton’s was called the “Cafeteria of the Golden Rule.” Clinton, after all, was a former missionary who believed in helping the poor. As the country slid into the Great Depression, Clifton’s policy was “No guest need go hungry for lack of funds.” In its first three months, Clifton’s served 10,000 free meals. Two years later, Frank Shaw—former grocery clerk, city councilman, and county supervisor—was elected mayor of Los Angeles, setting up a showdown that Hollywood could never imagine. Though opposed by the Los Angeles Times’ Chandler family because he was a “reform” candidate, Shaw won over the paper by reappointing former Police Chief James “Two Gun” Davis. With the Chandlers appeased, Shaw was ready to get to the real work ahead. He quickly hired his brother, Joe, to become the mayor’s “private secretary” on the city payroll. Joe kept the machine humming by selling jobs and fixing rackets—business as usual in the city. Meanwhile, County Supervisor John Anson Ford asked the civic-minded Clinton to apply his restaurant expertise to rooting out suspected food service corruption at L.A. County Hospital. Clinton succeeded so well at this task that Ford convinced Judge Fletcher Bowron to appoint Clinton to a grand jury to investigate corruption at City Hall. Clinton and the grand jury delivered the goods. Clinton’s grand jury report outlined how mob money, controlled by Mayor Shaw and protected by Chief Davis, was funneled into city elections; in return, city officials ignored the widespread vice strangling Los Angeles. Following the report, Clinton was declared the city’s public enemy No. 1 by Mayor Shaw, Chief Davis, and District Attorney Buron Fitts. Even the grand jury foreman, John Bauer, called Clinton “out of control” and derided him as the “Cafeteria Kid.” But when notary Frank Angelillo appeared before the grand jury to testify that Bauer was on the Shaw payroll, Bauer and D.A. Fitts arrived at Angelillo’s house with a squad of detectives and beat him badly enough to put him in the hospital. Clinton was undeterred. He raged against corruption on the radio during a nightly 15-minute broadcast. Something had to be done, and something was. On October 29, 1937, a bomb ripped through Clinton’s family home in Los Feliz. Luckily, no one was seriously hurt. Unfazed, Clinton ratcheted up his crusade by recruiting a former LAPD officer, private detective Harry Raymond, to expand his investigation of Mayor Shaw. Two months after the Clinton bombing, LAPD Captain Earl Kynette and his men of the LAPD “intelligence squad” blew up Raymond’s car. The Los Angeles Times suggested that Raymond and Clinton staged the bombing for publicity—until witnesses testified that the police had had Clinton’s house under surveillance for weeks. Raymond took his story to William Randolph Hearst’s Los Angeles Examiner and placed the blame on LAPD Captain Earl Kynette, who’d been spying on Raymond. Kynette took the Fifth to avoid testifying and was sent to San Quentin. It was proved that Kynette had personally bought the pipe for the homemade bomb. With the police captain bombing story featured above the fold for weeks on end, Angelenos were finally pushed beyond the brink of complacency. In a special election, voters turned Shaw out of office, making him the first U.S. mayor to be recalled. Judge Bowron became mayor and stayed in office for years until his support of a public housing project in Chavez Ravine allowed the L.A. Times’ Chandler family to take him down. The rest is a story for another time. For the record, I didn’t make it to the end of the movie Gangster Squad, so I can’t even guess what happened to Sean Penn’s Mickey Cohen. But I do know I would buy a ticket to see a movie about Clinton and Mayor Shaw. 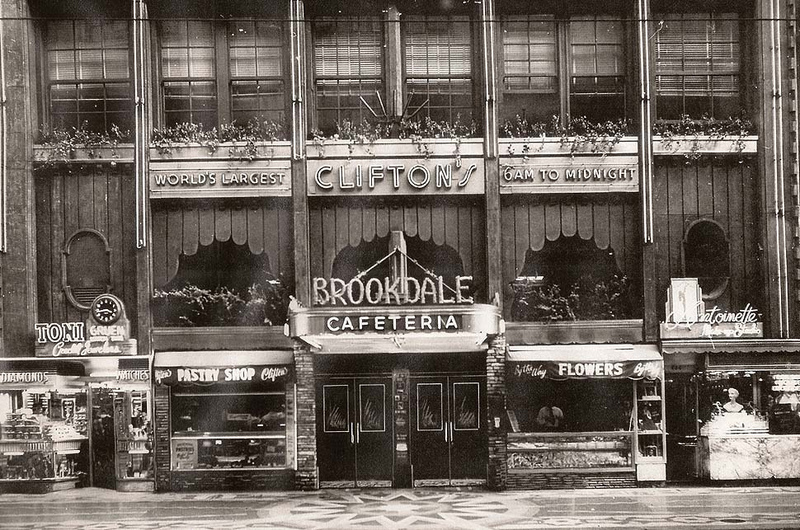 Today, Clifton’s last cafeteria downtown, the Brookdale, is undergoing renovations. It should be reopening soon. Jeff Adkison, a student of downtown L.A. history, lives in Los Angeles and works in real estate. *Photo courtesy of Paul Narvaez.